NOLA’s Algiers Point neighborhood is a a quiet suburb on the Mississippi River’s West Bank. Coined Algiers Point in the 1970’s, it’s known for its quaint houses, small art galleries, the open-air concerts at Algiers Ferry Landing and its three miles of walking and biking trails along its riverfront, the perfect stretch for picnics and enjoying great views of the New Orleans skyline. The City Planning Commission defines the area as approximately 50 city blocks bounded by Opelousas Avenue, Pacific Avenue and the river. Some houses in Algiers Point predate the Civil War, though most of the houses were built after the fire of 1985 destroyed much of the original housing. Algiers was part of the land grant given to New Orleans founder Jean Baptiste LeMoyne, Sieur de Bienville by the Company of the Indies in 1719. Before being annexed to New Orleans in 1970, Algiers was a bustling town with its own governance and thriving economy. The Algiers-Canal Street Ferry began operating in 1827, and has been in continuous operation ever since. The area became known for shipbuilding, repair and other riverfront endeavors, and by the 1850’s, rail yards lining the riverside employed many of the town’s residents. At its height, Algiers Point operated six separate ferries to New Orleans’ East Bank, including one capable of carrying livestock and railroad cars. The town was built on the site of the Duverje Plantation, which was subdivided by its owner around 1839. The plantation home, built in 1812, became the Algiers Courthouse, but was ultimately destroyed by the fire of 1895. The fire also leveled several blocks of the original neighborhood, demolishing much of the early architecture. While some early buildings still exist, including several Greek Revival, Italianate and Victorian styles, the District is now largely comprised of early 20th century architectural styles. 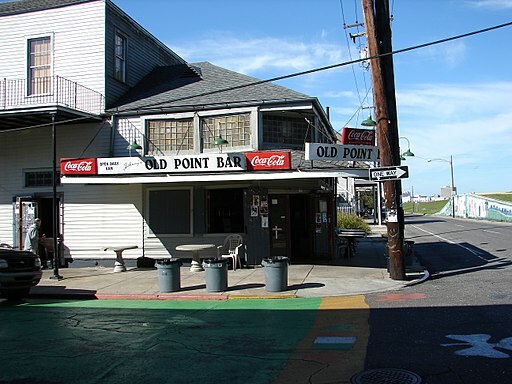 Algiers Point has something for everyone. If the lovely old oak trees and pastel cottages don’t charm you, the parks, restaurants and galleries certainly will.